File Name: Hector X. Delgado of Chula Vista, California. Notes: Chula Vista is on the Pacific coast, midway between San Diego and Tijuana, Mexico. Sunbow's Shipwreck had black hair and beard, and he wore his 1985 outfit with his shirt usually open to just below the sternum. The tattoo on his right arm was black, and his pants were a darker blue with a brown or tan belt. Shipwreck's file name was mentioned in the episode Captives of Cobra, Part 1. The Reel FX Shipwreck was based on the 2002 Joe vs. Cobra version. Shipwreck's parrot Polly spoke and acted intelligently, as a full-fledged character. The amount of yellow on his wings and around his eyes varied from episode to episode. Note that here, as with other characters, (silent) simply means no words spoken; Polly still vocalizes in the form of animal noises in some of those episodes. Accessories: silver soft percussion cap pistol with strap (new), smooth green parrot with yellow on face and wings, clips to arm (new, "Polly"), silver boarding hook and handle on black string (new). Shipwreck grew up in the shadow of the Navy, specifically the shadow of the sprawling San Diego Navy Yards. He enlisted at the youngest possible age with his parents' permission and proceeded to serve with distinction in the Mekong Delta where hand to hand fighting with river pirates, smugglers, and insurgents was the order of the day. Put in time at "Gitmo" and Yokosuka and was on hand at certain carrier-initiated operations in the Middle East. Graduated Naval Gunnery School Great Lakes. Qualified expert: M-16, M-14, Browning .50 cal., 20mm Cerliken AA gun, M1911A1. "Shipwreck is your quintessential sailor. He can splice a line, fry powdered eggs in the tooth of a gale and eat them, tell taller tales than a Senate Appropriations committee and take a three day liberty in Thule, Greenland and come back smiling." Toy Notes: Item #6446. Featured in 1985's A.W.E. Striker commercial. Re-releases: A slightly different version was released in India. A Tiger Force version was released in Brazil as Marujo. Accessories: black pistol (88 Shockwave's), black submachine gun (88 Hit & Run's), black rifle (90 Bullhorn's), large silver box-like spring missile launcher with handle on top and black trigger (new), two black spring missiles (93 Bazooka's), black knife (88 Hit & Run's), black air mask with two air hoses that attach to chest (new), black pair of flippers (90 Undertow's), black figure stand (common). SHIPWRECK is your quintessential sailor. He can splice a line with one hand, fry powdered eggs in 15 foot seas and tell taller tales than a Senate Appropriations Committee. Shipwreck grew up in the shadow of the Navy, specifically the shadow of the sprawling San Diego Navy Yards. He enlisted at the youngest possible age and proceeded to serve with distinction in the Mekong Delta where hand-to-hand fighting with river pirates and smugglers was commonplace. Having graduated from Naval Gunnery School, he soon joined the elite Navy S.E.A.L. team where he has earned almost as many medals on land as he has in the water. Motto: "I can swim 100 yards underwater to plant mines on the hulls of Cobra battleships, and that's without scuba tanks!" Variations: Some copies have black straps on the arms. Carded with a normal-sized or baseball card-sized filecard. Accessories: black air mask (94 Shipwreck's), black figure stand (common). Shipwreck grew up in the shadow of the Navy, notably the San Diego Navy Yards. He lied about his age and enlisted at 16. He soon became the quintessential sailor, able to splice a line, fry powdered eggs in the tooth of a gale, and actually stomach his own cooking. 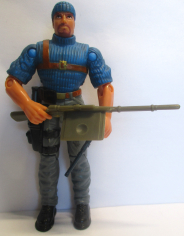 He joined the Joes and was a valued member of the team, except for an incredibly arrogant attitude that caused trouble more than once. He was finally packed off for Navy S.E.A.L. training in the hope that it would straighten him out. The result was a new S.E.A.L. for the Joes - who somehow managed to keep the same brassy attitude as before, despite the rigors of the harshest military training available. From General Hawk's Files: "Shipwreck is without question the most frustrating and annoying member of the entire team. He's arrogant, loud-mouthed, and has virtually no respect for authority. He must have somehow fooled them into thinking he'd changed to get through S.E.A.L. training. That's the really annoying thing about him - he's so blasted good at what he does that it almost compensates for his personality...almost." Motto: "The way I drive attack boats, the brass decided the best place for me is UNDER water." Toy Notes: Carded in a Toys 'R Us-exclusive Navy Assault Unit three-pack with Torpedo and Wet-Suit. Item #57066. Accessories: black pistol (88 Shockwave's), black submachine gun (88 Hit & Run's), black rifle (90 Bullhorn's), black knife (88 Hit & Run's), black air mask (94 Shipwreck's), black pair of flippers (85 Eel's), black figure stand (common). SHIPWRECK feels right at home on and in the water, but his training as one of the elite Navy S.E.A.L.s makes him the master of any environment. He joined the Navy as soon as he was old enough, graduated from Naval Gunnery School, and soon joined the S.E.A.L.s. He got basic underwater demolition training at the Naval Special Warfare Center in Coronado, California, and went on to participate in many covert missions before joining the G.I. Joe team to use his multiple skills to blast COBRA battleships and submarines out of the water. "The water is my turf, so I make sure COBRA ships are kissing the sea bottom when I'm done with them." Toy Notes: Carded in a two-pack with Sidetrack. Item #53084. This wave was exclusive to various online and specialty outlets. Two-Pack/Mission Disc Accessories: graphite mini-Uzi with light under muzzle (new), small graphite pistol with long silencer (new), brown-grey M14 rifle with curved magazine (new, with Sound Attack tab). Gum Bitz Accessories: brown-grey rifle (02 Shipwreck's, Sound Attack tab). SHIPWRECK can splice a cable, plot a gunnery solution, navigate through shallow waters, and keep the helm on a steady heading through the eye of a storm in twenty foot seas while eating a runny fried-egg sandwich with mayonnaise on it. A knowledgeable chief with hands-on experience in most naval vessels up to frigate class, he is a strong hand-to-hand fighter as well, and can be counted on to put the enemy out of commission and take names when boarding hostile ships. It is quite telling that none of the other G.I. JOE team ever calls SHIPWRECK "swabbie" or "sailor-boy." It's just not worth the risk! GUNG HO has been heard to remark that SHIPWRECK is the last guy he would want to get into a knife-fight with. This is not to say that he isn't a likeable and sociable individual. On the contrary, he is always the first at the mike on karaoke night, and can perform a number of amusing tricks with his tattoos. Why is it that COBRA B.A.T.s rub him the wrong way? Because they leak 40 weight oil on his fresh-swabbed decks, that's why! "I've never seen a more useless crew of lubbers as the G.I. JOE team at sea. If it wasn't for a salty dog like me, they'd all get swept overboard at the first squall." Toy Notes: Carded in a two-pack with Cobra B.A.T.. Item #57495. Reissues: Carded in March 2003 with Mission Disc #1 (Item #54435), and in February 2004 in the Gum Bitz figure single-pack assortment (Item #50403). The Mission Disc and Gum Bitz filecards lack the sentences about B.A.T.s. Accessories: silver silencer pistol (02 Shipwreck's), gold scepter (02 Cobra Commander's, with Sound Attack tab), black "Cobra Commander" battle helmet with silver faceplate and silver Cobra emblem (new), black cape with red Cobra emblems (02 Dr. Mindbender's), blue clip-on breastplate with black frame (new), black pair of clawed gauntlets with simplified red Cobra emblems (new), black pair of leg braces with simplified red Cobra emblems (new). SHIPWRECK can splice a cable, plot a gunnery solution, navigate through shallow waters, and keep the helm on a steady heading through the eye of a storm in twenty foot seas while eating a runny fried-egg sandwich with mayonnaise on it. A knowledgeable chief with hands-on experience in most naval vessels up to frigate class, he is a strong hand-to-hand fighter as well, and can be counted on to put the enemy out of commission and take names when boarding hostile ships or securing a hot enemy stronghold. It is quite telling that none of the other G.I. JOE members ever call SHIPWRECK "swabbie" or "sailor-boy." It's just not worth the risk! GUNG HO has been heard to remark that Shipwreck is the last guy he would want to get into a knife-fight with. This is not to say that he isn't a likeable and sociable individual. On the contrary, he is always the first at the mike on karaoke night, and can perform a number of amusing tricks with his tattoos. Toy Notes: Carded in a two-pack with Over Kill. Item #57430. Accessories: black revolver (02 Wild Bill's), black helmet with silver faceplate and red Cobra emblem (03 Shipwreck's), black cape with red Cobra emblems (02 Dr. Mindbender's), black breastplate with Cobra emblem outlined in red (03 Shipwreck's), black pair of gauntlets with simplified red Cobra emblems (03 Shipwreck's), black pair of leg braces with simplified red Cobra emblems (03 Shipwreck's). SHIPWRECK can splice a cable, plot a gunnery solution, navigate through shallow waters, and keep the helm on a steady heading through the eye of a storm in twenty foot seas while eating a runny fried-egg sandwich with mayonnaise on it. A knowledgeable chief with hands-on experience in most naval vessels up to frigate class, he is a strong hand-to-hand fighter as well, and can be counted on to put the enemy out of commission and take names when boarding hostile ships or securing a hot enemy stronghold. GUNG HO has been heard to remark that SHIPWRECK is the last guy he would want to get into a knife-fight with. This is not to say that he isn't a likeable and sociable individual. On the contrary, he is always the first at the mike on karaoke night, and can perform a number of amusing tricks with his tattoos. Just don't ask him to do his COBRA COMMANDER impersonation... he's been known to go overboard! "I'm a sea lover at heart, but show me a COBRA base anywhere and I'll hunt the varmints down, whatever it takes." Toy Notes: Boxed with a Toys 'R Us-exclusive playset based on the events of Spy Troops: The Movie. Item #55446. The playset was an adaptation of the Star Wars Geonosis Battle Arena. Accessories: dark grey hat with blue camo spots (03 Cross Hair's), dark grey hollow rectangular backpack with engraved pockets (new). SHIPWRECK can splice a cable, plot a gunnery solution, navigate through shallow waters, and keep the helm on a steady heading through the eye of a storm in twenty foot seas while eating a runny fried-egg sandwich with mayonnaise on it. A knowledgeabe chief with hands-on experience in most naval vessels up to frigate class, he is a strong hand-to-hand fighter as well. GUNG HO has been heard to remark that SHIPWRECK is the last guy he would want to get into a knife-fight with. This is not to say that he isn't a likeable and sociable individual. On the contrary, he is always the first at the mike on karaoke night, and can perform a number of amusing tricks with his tattoos. Accessories: grey rifle (03 Sgt. Hacker's), grey paintball marker (05 Frostbite's), green hat with camo pattern and grey goggles (03 Cross Hair's), light green backpack (04 Shipwreck's), black communications gauntlet (04 Duke's). Toy Notes: Carded in a two-pack with Electric E.E.L.. Item #00282. 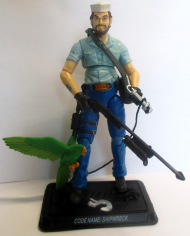 Accessories: black submachine gun (05 Snake Eyes's), black knife (04 Hi-Tech's), highly textured green parrot with yellow on face and wings, clips to arm (new, "Polly"), clear figure stand (common). SHIPWRECK feels right at home both in and on the water, but his training as one of the elite Navy S.E.A.L.s makes him the master of any environment. A knowledgeable chief with hands-on experience in most naval vessels up to frigate class, he is also a strong hand-to-hand fighter. And while the S.E.A.L. training may have helped him overcome his somewhat flaky reputation among his fellow G.I. JOE team members, he remains superstitious and never travels without two of his favorite things...a lucky vintage naval life vest and POLLY his parrot. SHIPWRECK was patrolling the Hawaiian Islands for drug smugglers in his PIRANHA Attack Boat, when he received the call from G.I. JOE Headquarters. This ultra-classified assignment required him to pick up CHUCKLES, who was working undercover near his location, and together they alone must locate the components of the downed M.O.T.H. satellite. This top secret piece of US Military hardware, a device whose most vital sections were designed to separate and survive re-entry in self-controlled descents on vectors spanning the globe, was sabotaged remotely by COBRA technicians - but must not be allowed to fall into the enemy's hands! "The water is my turf, and I don't like to swim with snakes!" Toy Notes: Boxed in a Collector's Club-exclusive Pacific Theater two-pack with Chuckles. 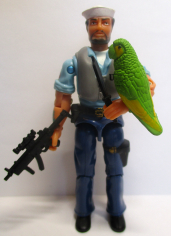 Accessories: black pistol (03 Beachhead's), black mini-Uzi (02 Shipwreck's), black sawed-off shotgun with brown grip and fore-end (new), blue-green parrot with light green head and orange beak and feet, clips to arm (new, "Polly"), black Joe figure stand. Graduated Naval Gunnery School Great Lakes. Qualified expert, M-16, M-14, Browning .50 cal., 20mm Oerliken AA gun, M1911A1. "SHIPWRECK is your quintessential sailor. He can splice a line, fry powdered eggs in the tooth of a gale and eat them, tell taller tales than a Senate Appropriations committee, and take a three day liberty in Thule, Greenland and come back smiling." 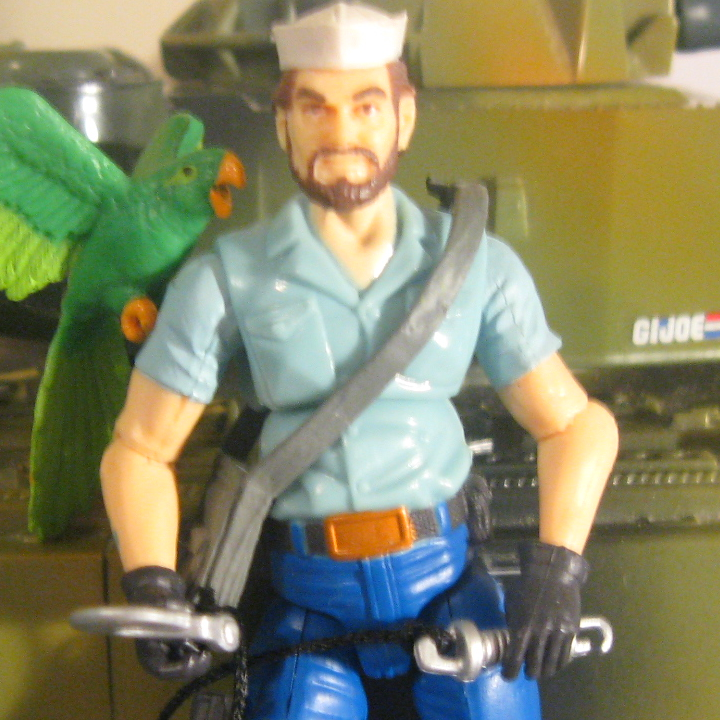 Accessories: black pistol (03 Beachhead's), blue-green parrot with light green head and orange beak and feet(07 Shipwreck's, "Polly"), orange life jacket with black belt (new), dark silver boarding hook and handle on black string (new), black Joe figure stand. Toy Notes: Carded in a two-pack with Copperhead and an original comic (#5). Item #30945. Accessories: black six-shot revolver with visible trigger in trigger guard (new), long black speargun with downward-curved stock (new), green parrot with spread wings, light green wingtips and tail, and orange feet and beak (new, "Polly"), grey satchel with two small pockets (new), silver boarding hook and handle on black string (08 Shipwreck's), black Joe figure stand. SHIPWRECK grew up in the shadow of the sprawling San Diego Navy Yards and dreamed of a life at sea. With his parents' permission, he enlisted at the youngest possible age and graduated the Great Lakes Naval Gunnery School. He has fought river pirates, smugglers, and other assorted thugs during his career before joining the G.I. JOE team. With his parrot Polly perched on his shoulder, he has faced the COBRA enemy on every watery battleground from vast oceans to murky swamps. As salty a seadog as ever sailed the sea, SHIPWRECK is nevertheless a steadfast teammate who will go to Davy Jones's locker and back to complete a mission. "The G.I. JOE team may be a bunch of landlubbers who wouldn't know a beam from a buoy, but they've got true fighting spirit that any sailor would respect." Toy Notes: Boxed with Snake Eyes, Lady Jaye, G.I. Joe Hawk, and Flint. Item #36449.